Mini Meatloaf recipe topped with homemade honey mustard and cheddar cheese. Portion controlled and cute for kids! 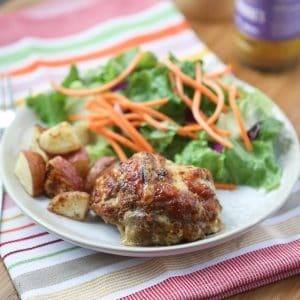 Serve with roasted red potatoes and salad and you’ve got yourself dinner! Preheat oven to 450 degrees. Set oven racks in top and bottom thirds of oven. Brush a rimmed baking sheet with oil or spray with cooking spray. In a small bowl, mix together mustard, ketchup and honey. In a medium bowl, combine beef, eggs, panko, garlic powder, 1/2 mustard mixture, 1/2 cup cheddar, 1/2 teaspoon salt, and teaspoon pepper. Form into six 2-by-4-inch loaves; place on baking sheet. Brush with remaining mustard mixture and top with remaining 1/2 cup cheddar. On another baking, toss cut potatoes with olive oil, garlic powder, salt and pepper. Transfer meatloaves to top rack in oven and potatoes to bottom rack. Bake until loaves are cooked through, 15 to 20 minutes, rotating baking sheets after first 10 minutes. Remove meatloaves from oven and continue to cook potatoes for another 10 minutes, until browned and crisp. Serve with oven roasted potatoes and salad. Nutrition info is based on using lean ground beef.